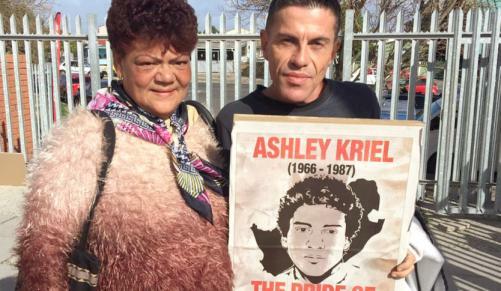 Being part of the community that came together to honour Ashley Kriel was a humbling experience, writes Danny Oosthuizen. But through the film Action Kommandant, produced and directed by Nadine Cloete, his legacy will live on. Born in Bonteheuwel, an area where people were dumped after being forcibly removed from communities like District Six, Sea Point, etc, Ashley from an early age was exposed to the wrongs of the apartheid regime. The lack of textbooks at his school was the trigger that started him and some of his friends to take action and protest. It came to the point that he had to leave the country as the apartheid police were hunting him, and he was no longer safe in his own community. He was in exile in Angola for about two years. Sadly he was murdered in 1987. Brutally so. At the age of 20. And it took years to find out the truth about his death. Imagine the pain his family and loved ones must have gone trough. I have met Nadine at the Cape Argus office and I felt the passion she has for this story. Infectious, I tell you. A piece of history I up to now knew very little about. For me then to go to Bonteheuwel where the movie was screened – mind-blowing! There, where it all started. There, where it happened. Being part of the community that came together to honour this man was a humbling experience. I googled this young hero and read all I could. But then to be there, with his family, crazy I tell you! It was hard to find a parking space. The hall was packed. Candles were lit in honour of this brave young man. To see youngsters with their #RacismStopsWithMe T-shirts, holding candles, brought tears to my eyes. So many people present knew Ashley. And they spoke fondly of him. They spoke with pride, respect and love about him. I had the honour of meeting Ashley’s sister, Michel Assure. I was the only white Afrikaans Boer present. And people, I just wanted to give this woman a hug. I felt so out of place. The apartheid police were white Afrikaners, like me. I was so ashamed of this fact. I grew up in a privileged society where my people did whatever they wanted with non-whites. Forced removals, forcing people to do school in Afrikaans, whites-only toilets, etc. This sick list goes on and on. To see the bitter-sweet reflection in Michel’s eyes as she speaks of her brother. I needed to say “I am sorry” – such a small word. But I could not utter it. This day will haunt me. I will reflect for days to come. I will explore this side of South Africa’s sick history. We as whites were never exposed to the truth. We honestly don’t have a clue. And I wonder, what would have become of Ashley if he was still alive today? Would he have been happily married? Would he have been a great dad? What type of work would he have done? I have been part of it today. And I am grateful. And I will honour his legacy. June 16 will never just be another public holiday in my calendar. I will honour those pioneers who laid the path to our freedom. And to the community of Bonteheuwel: You did us all proud! Thank you for sharing this moment with me. I walked out a better human being. Danny Oosthuizen is the author of the column “Danny’s Diary” which is published every Tuesday in the Cape Argus. thank you for this enlightening article. . The roots of Ashley’s struggle were planted in 1976 when I was a teenager in Bonteheuwel. That struggle must continue because imo very little has changed to change the attitudes and mindsets of certain South Africans. I see it daily. Danny you were not the only Afrikaans boer, I was also there and me too sat there so touch by the emotions around me and experiencing what my newfound friends had to go through in the 80s, by means of this incredibly well made film.